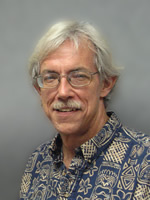 "Water Quality Coordination, Planning, and Staff Development in Hawaii". Funding: National Extension Service. "Farm*A*Syst / Home*A*Syst for Hawaii: Development of a Farm and Home Pollution Risk Assessment Program". Funding: EPA/Hawaii Dept. Health. "Turmoil in the Tropics: Current Environmental and Agricultural Issues". Funding: USDA Higher Education Challenge Grant. Provide statewide leadership for extension programs in natural resource management and environmental quality. Specific responsibilities include development and implementation of programs for public education and cooperative extension staff development on natural resources, pollution control, water quality, and watershed management.